Larissa MacFarquhar has been writing profiles for the New Yorker since 1999. In recent years, she’s turned increasingly to questions of ethics and charity in her work, with a particular focus on people who could be described as extreme altruists: a couple from Atlanta who sold their home and gave half the proceeds to villagers in Ghana; a woman who donated a kidney to a stranger; a family that adopted twenty children. In Strangers Drowning, which was published in September by Penguin Press, MacFarquhar provides a philosophical, aesthetic, and historical context for these acts. She also considers why we remain distrustful of these do-gooders even though their actions seem straightforwardly laudable. I sat down with her at a café on Bond Street in Manhattan—a not quite ethically neutral place—to talk about the book. What brought you to writing about morality and altruism? One starting point was the philosopher Susan Wolf’s essay “Moral Saints.” She makes the argument that a morally perfect person would be an unappealing human being—he would be alien, humorless, narrow, rigid, devoid of many of the qualities that are most valuable and wonderful in human life. She acknowledged that to regular people this idea would not be at all surprising, but said that to philosophers it should cause some discomfort, because at least in theory, morality is the kind of thing that the more there is of it, the better. If too much moral behavior is a bad thing, then there must be something wrong with the way we think about morality. I thought it was a terrifically interesting argument, and I also thought that it was one that I could add to as a journalist. Wolf as a philosopher was talking about the idea of perfection, but I thought it would complicate the discussion to think about actual lives—the lives of people who aren’t perfect, because of course nobody is, but who push themselves to moral extremes. I started out by talking with people who had donated one of their kidneys to a stranger, and was surprised and intrigued to discover how much hostility they’d encountered. Some of their family members were angry because they thought, “Why are you giving a kidney to a stranger, what if I get sick? What if our children get sick?” Their friends thought it was just a bizarre thing to do. And transplant surgeons were skeptical; they suspected the donors might be crazy. All this seemed to support Wolf’s thesis that we’re suspicious of extremely moral people. How did you hit upon the term “do-gooder” to describe those who go to moral extremes? I liked the term “do-gooder” because it came with a lot of baggage. I found that sometimes when I would say to someone, “We’re ambivalent toward very good people,” he would say, “No, we aren’t. What are you talking about?” But if I used the term “do-gooder,” everyone immediately knew what I was talking about, because that term contains within it the very cultural ambivalence I want to explore. And then at the same time I was also trying to rescue the word from that ambivalence, to ask people to rethink the assumptions it carries. From Larissa MacFarquhar’s Strangers Drowning, which was published in September by Penguin Press. Aaron knew he had to donate as much money as he could to international aid, that much was clear to him, but what else should he do? He decided that animals were more oppressed than people, and among animals, the ones lower down the food chain—the non-mammals, the ones that weren’t smart or cute—were the most oppressed of all. Nearly everyone cared about dogs and cats, many people cared about rabbits and cows, but very few people cared about chickens. At first, after making this decision to focus on animals, he made a point of spending some time each year in the library, reading anti–animal-rights literature in order to test his principles, to make sure there wasn’t some compelling argument out there that would lead him to change his course. He wanted to be rational about it; after all, he was choosing animal-rights work for logical rather than emotional reasons. But after a while, he became convinced that he really was on the right track, and he stopped doing this research. It wasn’t as if the rights of farm animals conflicted with the rights of humans: eating less meat was good for human health, it was good for the environment, and the undocumented immigrants who worked at slaughterhouses were some of the most ill-treated and miserable workers in the country. After he decided that animal rights would be his thing, he began to see suffering animals everywhere. Once, in college, he was rushing to get to a final exam in a course he really needed to get into graduate school, and the final exam was a large part of the grade. But it was raining, and worms were coming up out of the grass and wriggling onto the paths. He knew that if he didn’t pick them up someone would step on them and crush them to death. So he stopped and picked up the worms and put them back on the grass, and he was late. Then, at the end of the exam, he was racing to finish the final question, he had the answer on his calculator and was about to write it in his book when the examiner called out, Pencils down! Of course, other students were still scribbling away. And he had the answer already, right there on his calculator. But he put his pencil down. Did you find yourself more sympathetic to the do-gooders than you thought you would be? Well, I was pro-do-gooder from the get-go. If anything, I moved in the other direction. I still wholeheartedly admire the people in the book, but I came to have more sympathy for the depth and the profundity of what’s pushing against them. In the beginning I imagined it was mostly a lot of petty feelings—we don’t want to be made to feel morally inadequate, and we find self-righteousness and judgmental people annoying. But then I came to see that the big divide between do-gooders and regular people is in how we think about our families. Regular people want to give their family all they possibly can, and think not only that that’s morally justified, but that doing anything else is kind of monstrous. Do-gooders love their families just as much as the rest of us do, but they also feel obliged to take care of strangers, even when that conflicts with caring for their families—even when it entails significant sacrifice for everyone. It’s interesting that although all religious traditions encourage you to give to charity, they are quite different in how they consider duties to family versus duties to strangers. In Christianity, Buddhism, and Hinduism, for instance, there’s quite a bit of room for somebody who abandons his family for the sake of a larger ideal. In Judaism and Islam, traditionally one is required to give a certain amount to charity, but forbidden to give too much, lest you impoverish your family. Forbidden. Some critics of effective altruism worry that domestic charities and arts organizations will have to shutter for lack of donations. The risk of that is approximately zero, I would say. I mean, arts organizations are perpetually lacking in funds, but I think the danger that their funding will dry up altogether because everyone suddenly joins the effective altruism movement and starts giving all his money to strangers far away is pretty close to nonexistent. The vast majority of charitable donations in this country go to local causes—mostly religious ones. It’s relatively rare for people to believe that they owe something to people who are truly strangers, who are not their people in any way. Since you’re something of an expert on charitable giving now, do people ever ask you for advice on where to donate money? Dammit, no one has asked me! 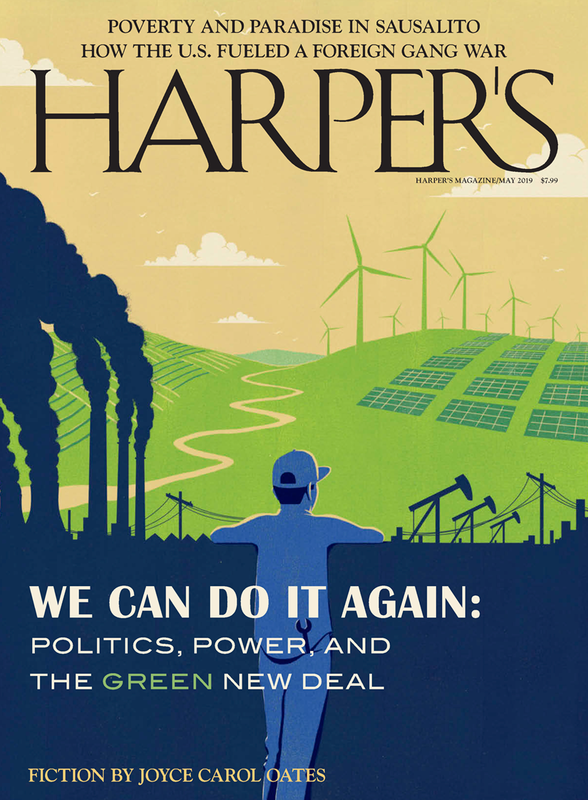 Do you want to tell the readers of Harper’s Magazine what to do? No, I don’t know what to do! There’s no question that most of us could do a lot more than we do. But as for what we should do, that’s not for me to say. This is not a book—probably to my detriment—that comes with a prescription for how we should live our lives. It’s a book that, I hope, makes that question harder to answer. Did you consider writing about your own family in the book? No. This is not a book about me. In my writing in general I don’t use the first person, and the reason is always that I want the reader to feel that he is confronting and encountering the person I’m writing about directly, without me getting in the way. I think about it like a film: in a film, the director only has to walk in front of the camera for one second for it to become a totally different kind of movie, about something totally different—about the director, about cinematic form rather than the subject. And I didn’t want to do that. I wanted the reader to feel as though he’s alone with these people, and reckoning with them by himself, and making up his own mind. May I ask about your use of paraphrase? You avoid direct quotations in a lot of your profiles. I do. The reason, again, is because I want to give the reader a sense of intimacy with a subject, a sense that they’re inside that person’s head. Quotations are distancing. You would think they’re more direct, you would think that they bring you closer to a person, because they are, after all, exactly what came out of his mouth, but in fact if you read a quotation, it reminds you, albeit perhaps unconsciously, that you’re not inside his head. But if you paraphrase the thought, you feel that you’re encountering thought rather than speech. It’s the same substance but a different feeling. When I wrote about Aaron Swartz, the Internet entrepreneur who committed suicide, I decided to do the opposite: that profile consisted almost completely of quotations from people. I did the opposite, because whereas usually what I’m trying to convey is a vivid sense of presence, one of the most important things about Aaron at the moment was that he was absent, that he was gone. That was a desolating, overwhelming fact for all the people I was talking to, and so in the piece I wanted to convey not just a sense of absence, but of abandonment. I thought it would contribute to that sense if I, as the writer, were also absent—because usually an authorial presence is comforting, it gives the reader the sense that someone is holding their hand and leading them through the story. In this case I wanted the reader to feel some of the abandonment that Aaron’s family and friends felt. In the profile of Sue and Hector Badeau, who had two biological children and adopted twenty more, you set off the quotations like dialogue in a play. In that case, I wanted to give the reader a sense of the sheer number of people involved in the family. I wanted to give a sense of cacophony and unevenness. This is not some seamless family that has come about by organic means and is more or less homogenous; this is the opposite of that, it’s a collection of very, very different people who clash with each other sometimes and who grew up crowded all together in the same house. The life that Sue and Hector chose was so disruptive, and so unsmooth, and I wanted that to be part of the experience of reading it: I wanted the reader to feel his reading—the narrative forming in his head—constantly interrupted by people speaking, people who hopefully sounded very different from each other. Are you in touch with any of these people still? I was hoping this was going to be a happy ending—that she’d eat the apple this time without worrying about it. Well, she would have done that now, because she’s changed. Part of the reason I was so happy to have their story in the book was because they were so young when I met them, I think they were about twenty-five, I was able to see the development of their system of ethics happen in real time. They made a lot of their big, life-shaping decisions over the course of the years that I was talking to them—they were still in the middle of working out a set of moral parameters that were going to work for them in the long haul. When I first met them, Julia especially was much more distressed and anxious about her commitments and what duty required of her; now she’s far calmer. These days, I think Julia would have gotten herself a candy apple if she really wanted one, it would have come out of, I don’t know what their budget is these days—$38 per week, or I imagine it’s probably a little higher now. But Julia is very sensible, she prefers ice cream, as should anyone. Candy apples are actually kind of gross. Were the do-gooders pleasant company? Oh yes, I really liked all of them. Now mind you, of course, this wasn’t exactly a hostile interview—this is a book about extremely moral people, after all, so that made things more relaxed than some interviews can be when the interviewee doesn’t know where you’re going with a story. But no matter what the questions are, if you’re genuinely trying to explore why someone came to make the choices he made in his life, interviews can be really fun and also very moving. In the case of Julia and Jeff, as I said, we were talking about questions they were deciding right then and there, so there wasn’t too much to dig up in the past, but in the case of the older people I wrote about, they were revisiting decisions they had made decades earlier, and had to think about their whole lives, and why they had chosen that path and not the other one, and how would things have been different if they hadn’t, and was it the right thing to do. Those are deep questions that one doesn’t think about too much in the ordinary course of things, and that can be a very intimate and wonderful kind of conversation. Were they happy with their lives, on the whole? Oh yes—most of them, most of the time, yes. They have their ups and downs like anyone else, and a lot of those ups and downs have to do with the same things that afflict the rest of us—love, lack of love, sickness, things like that. But aside from that ordinary stuff, the amazing thing about these people is that they are living as they believe they ought to. Imagine being able to say that! It’s not that they think they’re perfect by any means, but they don’t feel that they’ve taken the fundamentally wrong path in life. They feel like they’re on the right path, and they’re marching along it as they ought to, and that’s a fantastic feeling. Michael Paterniti discusses “Driving Mr. Albert,” a story he wrote for Harper’s, in 1997, about driving across America with Albert Einstein’s brain.